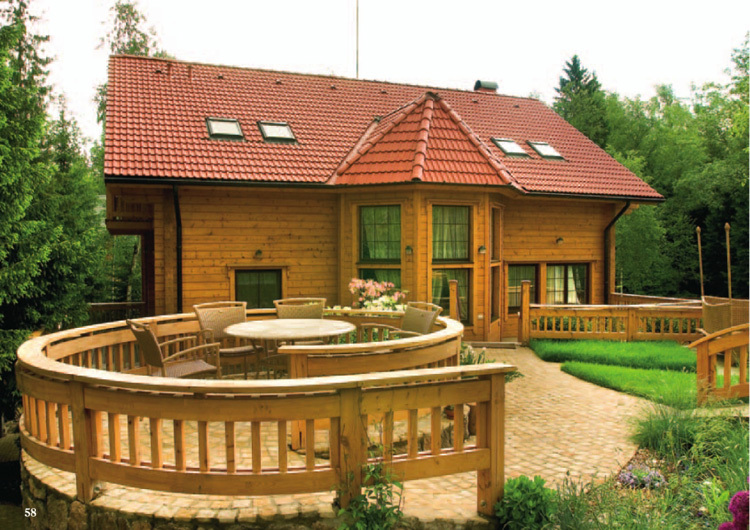 — Drawing up the outline sketch of the wooden house. — Preliminary mounting of box of the house from the rounded bar (needles) with partitions, daylight, daylight openings, balconies, terraces, beams, produced mechanical or chopped in the manual method, according to the project in the territory of producer and repeated mounting of box of the house on the base of the customer. — Impregnation of bar antiseptic agent. — Installation of consolidation in trenches of bar and the place of connections. — Drawing up scheme of disassembly (assembly) of box of the house. 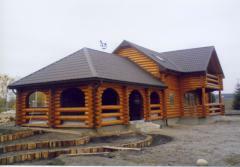 — Rafters on roof (wooden bar 150х75) as material. Height of walls of the first floor makes 2.5-2.7 m. At the same time about 10 houses the Cost of houses can be produced the area of which of less than 50 m of kV is calculated at other price. The customer pays transportation costs and provides workers with conditions accommodation at repeated mounting of the house. At construction of houses the pack up to 40 cm thick can be used. 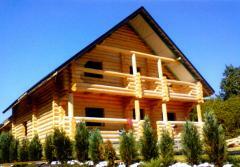 Unbelievable price on Guest houses from the rounded log in Mukachevo (Ukraine) company Hata - Srub, SPD.